I admit, there is a bit of non-Big 2 bias this week, but I think that only speaks to the variety and volume of work that the smaller publishers are putting out. With that in mind, let’s jump into this week’s comics! First up, Deathmatch #5! Imagine the world’s greatest heroes and villains all forced to battle one another until there is only one survivor. This is the premise of Deathmatch. Imprisoned by aliens, Earth’s greatest and worst must face off in a deadly tournament until only one remains. Mystery and intrigue abounds as they must figure out not only who captured them, but also what each of the competitors are up to. The power has gone down on the alien ship and the surviving heroes and villains are looking for a way to escape. It’s only after witnessing the hero known as Meridian and watching him battle an unknowable force that the adventure comes to an end. It seems that many of the characters have secrets and finding these secrets out is likely the key to understanding just what is going on in this story. While superhero deathmatch stories can seem played out, I think this one is something fun. There is a certain sense of mystery and dread involved that makes it more than just a typical story of the sort. It’s a great mix of interesting story and fantastic art that makes a worthwhile read. New readers might want to skip to the back where there is a bit of a primer on most of the characters. This will definitely help in figuring out who is who and who killed who. With this information, this issue is definitely one that a new reader can jump into. Season one of the series ended last month, so this issue kicks off season two. With a series that is often compared to Lost it’s only right to expect some plot twists, but Morning Glories does it in ways that absolutely no one expects. Casey does a bit of time traveling as she exits the cave from previous issues. It’s in this period that she takes part in some key moments in Morning Glories history and undergoes a bit of a transformation. It’s her role that completely changes how past issues can be perceived and changes many a theory of how the story will play out. Nick Spencer and Joe Eisma come together to make a great issue. 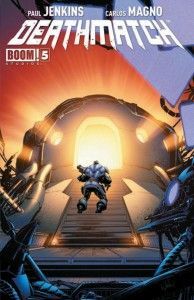 Spencer’s often confusing storyline only helps to pull the readers in while Eisma’s cinematic art makes the comic feel more like a television show or movie. 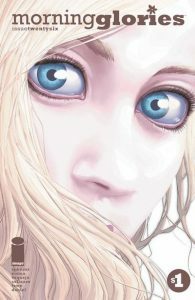 It’s this unique style and story that makes Morning Glories one of those stories that you love, but don’t always understand. As with an actual television show, jumping into season two may be a bad idea. New readers would be best off picking up the first few trades before they dive into this story. Trust me though, it’s worth it. Parental Concern: Mild. Violence, language. The world’s first superheroes do great things and tons of good, but what of their children? 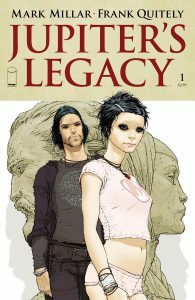 This is the sort of question that Jupiter’s Legacy delves into. After journeying to a mysterious island, a group of friends are given great powers during the Great Depression. They do great and amazing things, but what about their ultimately disappointing children? Sheldon and his friends journey to a mysterious island on a hunch. When they’re gifted with astounding abilities, they use them to help pull their country out of the Great Depression and help it through World War II. It’s their children who have the real trouble as they must strive to live up to this example that their parents have set. While Frank Quitely makes some absolutely fantastic art, Mark Millar and his story ultimately fall a bit short for me. It’s an interesting story and a nice look at it, but it just doesn’t seem to work as well as it could. Future issues may change this, but this is the impression from the first issue. New readers can dig into this comic. It’s completely new and has no ties to other works. If anything, the amazing art by Quitely may turn off a few potential readers because it’s not the stereotypical comic style. Don’t be that reader. Parental Concern: Considerable. Violence, language, etc. Deadpool is an assassin like no other. With regenerative abilities and a bit of a mental disorder, he will gladly take jobs that no one else will. In his last adventure he killed zombie presidents at the request of S.H.I.E.L.D and had a black woman trapped inside his head. Needless to say, things are only getting worse for Deadpool. Deadpool is having a conversation with Agent Preston, who now shares his head, when it becomes clear to him that he needs to find another body for her to inhabit. After a talk with a demon and more than a few threats, Deadpool is off to collect some souls for the demon and hopefully get Agent Preston a new body in the process. It’s only after killing an invulnerable Italian that Deadpool is ambushed and the reader learns that something strange must be going on. While the issue is funny, I felt it fell short overall. The last few pages were honestly the most compelling out of the entire issue. Some of the jokes made me chuckle, but, overall, it felt as if it was trying too hard to make Deadpool funny when he’s just naturally a very darkly funny character. 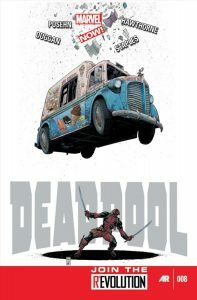 The art is a great fit for the story as it is equally at home showing action and explosions as it is the weird, often terrible things that Deadpool does on a daily basis. New readers, jump in. This issue might be to your liking. The first couple of pages are a great way to catch up on the story so far, so new readers shouldn’t be too left behind. All in all, it’s friendly for new readers, while maybe not being the best of comics.